This extensive compilation of worksheets has been diligently drafted for students in Grades 4 and 5 to guide them in converting number names to standard decimal numbers and vice versa. 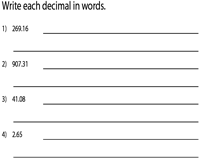 Worksheets have been segregated based up on the place values of decimals: tenths, hundredths, thousandths, and millionths. This enables an easy download environment. A number of free printable worksheets are up for grabs! Convert number names to standard decimals and vice versa with this batch of multi-level worksheets. Exclusive combined review worksheets based on decimals in tenths are also included to assess your child's grasp on the topic. 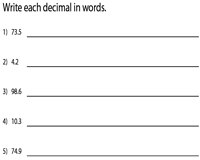 Transform decimal numbers into number names and vice versa with this array of worksheets. 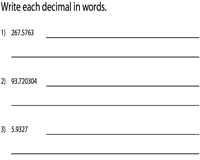 Use the combined review worksheets to reinforce the concept of converting decimals/number names in hundredths. 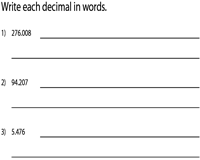 Employ this collection of worksheets to interpret number names and decimals in thousandths. The combined review worksheets form a perfect tool to evaluate a student's knowledge in the subject. Transform number names to decimals and vice versa up to thousandths with this series of worksheets. Become a member to avail unlimited access to all worksheets. Use the answer key to help them verify their responses. This compilation of worksheets provides plentiful practice in writing number names / decimal numbers up to millionths. Click on the 'Download the set' option for the entire set of worksheets featured here.